Any appliance maintained spotlessly clean not only looks aesthetically pleasing to the eye but also helps in increasing its life. Paradoxically, a machine that cleans your soiled clothes also needs to be cleaned as it could harbor mildew and mold in perfectly hidden places and odors that may cling to its walls and transfer over to your laundry. The cleaning process and the quantity of cleanser required varies slightly depending on the type of washing machine. Let us help you clean up your top load washing machine. For information on cleaning front load washing machines, please read our article – Cleaning Front Load Washing machines. It is easy to clean a top load washing machine. A little cleaning cloth and some store bought liquid machine cleanser are the only things you need. If you don’t have a machine cleanser, chlorine bleach or white vinegar are perfectly suitable as cleaning solutions as well. Vinegar is excellent for removing any mineral built up that has collected and can soften any soap scum or other residue that might build up inside the washer and the hoses while bleach is widely used in factories as a cleaning and disinfecting agent. 1) Begin by adjusting your washer to its longest cycle, maximum capacity and hottest temperature. 2) Add 4 cups of white vinegar or bleach or machine cleanser to the hot water. After closing the lid leave it to agitate for a couple of minutes. 3) Now stop the machine by opening the lid. Allow the machine to rest for about an hour. This will give the solution sufficient time to kill the hidden bacteria in the nooks, crannies and the hoses of the unit. 4) Run the complete wash cycle. 5) In case you have a very dirty washing machine you may need to repeat the above steps again. Having taken care of the interior it’s time to concentrate on the exterior of the machine including the fabric softener and the bleach reservoirs . Dip a clean rag or microfibre cloth into your cleaning solution. Carefully wring it taking care to see that it is not too wet. Now methodically wipe the exterior lid and the control panel. Scum and dirt has a tendency to accumulate around the bleach reservoir or dispenser. This too needs to be cleaned. Remove the softener dispenser from the agitator and thoroughly wipe it externally and internally by a rinsed cloth. You should now have a sparkling clean, stainless and odour free washing machine. If you have a front load washer you can read our article on cleaning a front loader here. 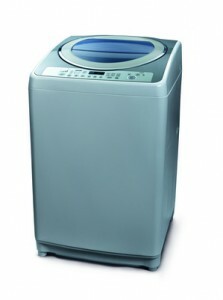 Please learn more about the top load washing machines available in the Indian market place at Conzumr.com. Previous story Air Conditioner buying made painless!